Mojave microphones are an excellent choice for a vocal miking and will help to reduce or eliminate several common problems before they occur. Recording vocals can be tricky in that a slight variation in placement can yield a large effect. 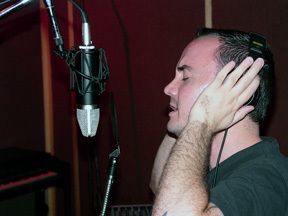 Generally, a good starting place is about 12″ from the microphone with the mic capsule either level with or slightly above the singer’s mouth (see photo). A pop filter is a must when recording vocals. Placing the mic slightly above the singer’s mouth, pointing down at a slight angle, can help control plosives and yield a slightly more open sound on some singers. Due to proximity effect (see ‘What is proximity effect?’ in the FAQ section), decreasing the distance between singer and mic can greatly increase the bottom end, which may or may not be desirable. Getting too close to the mic can create unwanted artifacts, such as lip smacks and other mouth noises that are difficult to deal with after the fact and should be avoided. Choices of processing gear, such as mic preamps, compressors and converters all play a role in recording a great vocal sound (see ‘Mic Preamps’ and ‘Compressors and Limiters’ above). Care should be taken in setting the preamp gain on loud passages to avoid overloading the input stage of the pre. Compression can help smooth out the dynamic range of the performance and allow a hotter level to ‘tape’, whatever your recording medium might be. For a place to start, try a 4:1 ratio, compressing -3 to -5db on the peaks.